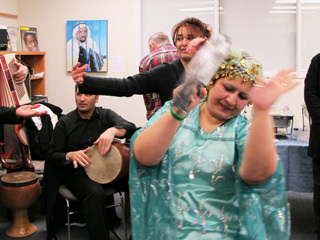 A nice warm international atmosphere permeated the Iranian New Year’s party Thursday evening. There were no name tags or invitations to introduce yourself to your neighbour. The friendliness came naturally, partly because the organizers were each asked to bring a non-Iranian friend. Many people knew each other already. I had learned about the party on the Internet. I knew no one there except my friend Romaine, who goes with me to many ethnic events. I found myself talking almost immediately with people from Germany, Zimbabwe, Singapore, as well as Canada and Iran. Most of the 80 or so people there were Iranians. The friendliness was also the result of the intimate size of the rooms, the office of Amnesty International, and its people-to-people purpose. This is the organization that monitors and advocates for prisoners of conscience all over the world. The rooms were small. Tables were along the walls, covered with petitions asking governments to free people whose only crime was to do what many Torontonians do freely. They had criticized their governments. Although there was no pressure to do so, many of the party-goers spent their time signing petitions and trying to connect with the prisoners. The tables had cards where anyone could write a note of support to these brave people, cards that would offer some feeling that they were not alone in the world. Amnesty would deliver them. 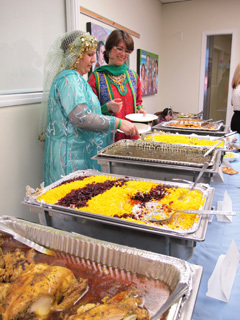 There was the abundance of delicious Iranian food, almost all home-cooked by members of the Iranian Action Committee that organized the event. It was wonderful. There was no charge for the party, but of course donations were appreciated. We all feasted on chicken and two kinds of rice (one dish had a dried red cranberry-like fruit and bright yellow saffron rice in dramatic stripes). Dishes were labelled with exotic (to us) names like ghormeh sabzi stew (kidney beans and lamb) and mirzam ghassem. Have you ever heard of olives in pomegranate sauce? All the dishes were yummy. Two Iranians spoke of their experiences with Iranian prisons. 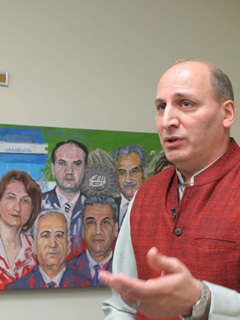 U. of Toronto Professor Ramin Jahanbaglou talked of the importance of Amnesty International. In 2006, he spent months in solitary confinement, charged with supporting the “velvet revolution.” A woman spoke about being the wife of a political prisoner. One man played an accordion, another drummed with fast-moving fingers. A couple of women in colourful Iranian dress danced in graceful Middle Eastern style. Another two sang. Several people of various national origins got up and danced. It was a happy evening, tinged with sadness. It was special because the event not only gave us a good time. It was also a profound learning and sharing experience. The office walls were hung with paintings of the faces of political prisoners. Sounds like a bitter-sweet experience, Ruth. Nice post.